Full length protein, corresponding to amino acids 1-224 of Human FKBP25 (NP_002004.1, UniProt ID: Q00688). FKBP25-transfected 293T cell lysate; Human liver tissue lysate; HeLa cells. Our Abpromise guarantee covers the use of ab168772 in the following tested applications. WB 1/500 - 1/1000. Predicted molecular weight: 25 kDa. ICC/IF Use a concentration of 10 µg/ml. For IF applications antibody purification with Protein A will be needed prior to use. 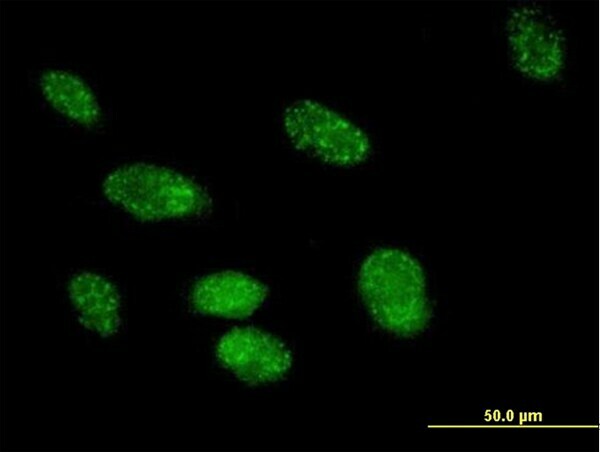 Immunofluorescence analysis of paraformaldehyde-fixed HeLa cells, labeling FKBP25 using purified ab168772 at 10 µg/ml. Antibody purification with Protein A will be needed prior to use. ab168772 has not yet been referenced specifically in any publications. Publishing research using ab168772? Please let us know so that we can cite the reference in this datasheet. There are currently no Customer reviews or Questions for ab168772.